Samsung Mobile has announced two all-new products today. 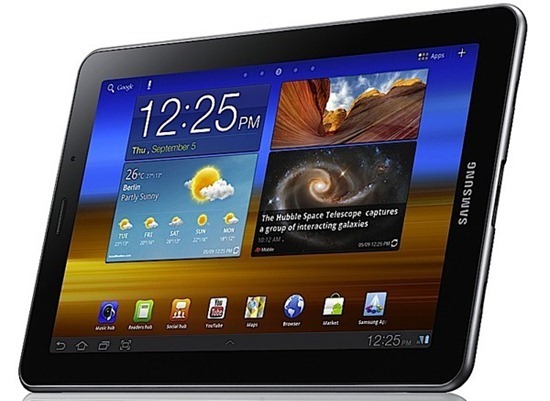 The first is the Galaxy Tab 7.7 which, you may have guessed, is a tablet while the second product is the Galaxy Note. Both are based on Android, have dual-core processors and come with Super AMOLED HD Plus displays. The news comes from a press event held by Samsung at IFA where the two gadgets were announced. Let’s discuss the Samsung Galaxy Tab 7.7 first. Thanks to its descriptive name, one can easily tell that it is a 7.7” tablet. 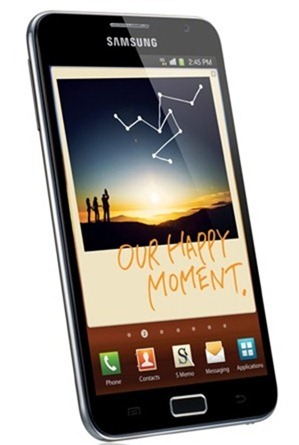 It is based on Android 3.2 “Honeycomb” with Samsung’s custom TouchWiz UX running on top. It packs a dual-core 1.4GHz Exynos chip with 1GB of RAM and 16/32/64GB of storage. There is a 3MP camera on the back with a 2MP camera on the front for video chatting and casual photographs. Weighing in at a light 334 grams, the Tab comes with 5,100mAh battery which is rated at 10 hours for video playback. Besides this, you get the usual Bluetooth, WiFi, HSPA+ connectivity and microSD card slot that we’ve become used to seeing on all Android tablets. The Galaxy Tab 7.7 is essentially the Honeycomb-based version of the original 7” Galaxy Tab which was based on Gingerbread. The greatest feature that this tablet possesses is the 1280×800 Super AMOLED Plus display. Thanks to Samsung’s advanced display technology, you’ll get to see amazing colors, crisp text and awesome viewing angles which are guaranteed to leave everyone impressed. Release date and pricing isn’t confirmed yet, but we expect to see it in stores later this year starting at $399 or $499. The Galaxy Note is a new device for Samsung but not all that new to the world of Android smartphones/tablets. Samsung is aiming this 5.3” smartphone for the folks who wish to have tablet-like experience with the form factor of a smartphone. The Galaxy Note is based on Android 2.3.5 “Gingerbread” with Samsung’s TouchWiz UX running on top. It packs the same dual-core 1.4GHz Exynos chip that is inside the Galaxy Tab with 1GB of RAM, 16/32GB internal storage. There is an 8MP rear-facing camera along with a 2MP front facing one. Its 9.65mm thick, 178 gram body carries a removable 2,500mAh battery. Connectivity-wise, the Galaxy Note comes with HSPA+, Bluetooth and WiFi. Samsung has included a stylus called the S Pen for taking notes. Included apps like Planner, Calendar and To Do List make proper use of it while the S Memo app is dedicated for taking notes, accepting input from the stylus, audio, photo and video,. The company will be releasing the S Pen SDK to third party developers soon so that they can make apps which make use of the stylus. The most awesome feature of this device, besides its comfortably-sized display, is the technology behind said display. The Super AMOLED HD Plus display on the Galaxy Note pushes 285 pixels per inch at a resolution of 1280×800. This is not only going to make everything look crisper but thanks to Samsung’s advanced display tech, vibrant and bright as well! This is the display which we expect to see on the upcoming Nexus Prime. No release date or pricing has been announced yet.